Scotland’s most senior law officer has said the Brexit process should not be triggered without the consent of the Scottish Parliament. A legal document produced on behalf of the Scottish Government by the Lord Advocate James Wolffe QC argues that EU withdrawal should only take place if supported by MSPs. The UK parliament will not normally legislate with regard to devolved matters without the consent of the Scottish Parliament. With the majority of MSPs opposed to Brexit, Holyrood is likely to find itself at loggerheads with Westminster over Brexit - an outcome that could lead to a constitutional crisis. Mr Wolffe’s submission was published yesterday and outlines the Scottish Government’s case in its forthcoming legal battle with the UK Government over Brexit. Next month Theresa May’s Government will mount an appeal against a High Court decision, which ruled that MPs must be given a vote on Article 50, the process that will deliver the UK’s exit from the EU. Mrs May has appealed to the Supreme Court in an attempt to win the right to trigger Brexit using existing ministerial powers - otherwise known as the Royal Prerogative. The Scottish Government has entered the legal battle arguing against the UK Government’s stance. In his submission, Mr Wolffe said: “It is a matter of constitutional principle that laws cannot be amended or repealed by an exercise of the royal prerogative alone”. He said using the royal prerogative alone was “unlawful” and added that Holyrood’s legislative consent should also be sought. He wrote: “The effects of withdrawal from the EU on devolved matters are such as to engage the legislative consent convention under which the UK parliament will not normally legislate with regard to devolved matters without the consent of the Scottish Parliament. The legislative consent convention says that any laws, which alter the competencies of Holyrood must “normally” have the consent of the Scottish Parliament. The Scottish Government’s position was echoed in a submission by the Counsel General for Wales Mick Antoniw whose written statement, stressed that he was “not seeking to reverse the referendum result” but a new law would need to be passed at Westminster and Mrs May could not “short circuit” the requirement for the devolved institutions to give their consent. Mr Wolffe’s submission was published as discussions over Brexit dominated a meeting of the British Irish Council in Cardiff. 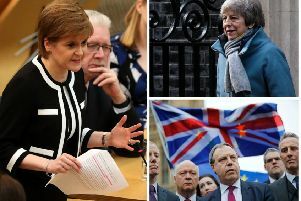 At the meeting Nicola Sturgeon admitted it would be “challenging” to protect Scotland’s place in the single market as other European politicians attacked her plans for separate Scottish Brexit deal. Her aspiration to maintain Scotland’s relationship with the EU when the rest of the UK comes out came under fire as the First Minister discussed the implications of Brexit at the British Irish Council (BIC). Ahead of the BIC meeting in Cardiff, Wales’s First Minister Carwyn Jones said he was unable to see how Scotland could remain in the single market while the rest of the UK left. “I can’t see how it would work,” Mr Jones told Radio Scotland. He said separate market access arrangements north of the border would mean customs posts at the border. “There is no other way to deal with that,” he said. Ms Sturgeon’s plans were also criticised by Esteban Gonzalez Pons, who leads the Spanish delegation of MEPs in the European Parliament’s largest political grouping. Mr Pons said proposals for a special Scottish deal were “impossible” and added that the Spanish Government would opposed any plan by the Scottish Government to stay in the single market if the rest of the UK withdraws. Madrid is against a separate deal for Scotland for fear that it would encourage the Catalan and Basque movements in Spain. After her meeting with the leaders of Britain’s devolved parliaments and Irish Taoiseach Enda Kenny, Ms Sturgeon said the UK Government needed to provide much more clarity on the issue before Article 50 of the Lisbon Treaty was triggered to commence the Brexit process. She said the prospect of a “hard” Brexit with the UK leaving the single market was a real possibility. “From the perspective of the Scottish Government of course we are looking at, if those circumstances arise, how could we best protect our own interest, protect our place in the single market, even if the UK decides to leave,” said Mrs Sturgeon. Mr Kenny raised concerns from the Irish Republic’s perspective about the potential of border checks and trade tariffs. “I didn’t like the decision of the UK electorate but I respect it and we now have to deal with it,” he said.